← Is The Mighty 1090AM Buying Twitter Followers? Never have I been so proud of you guys. You lobsters. I said we could do it… and you came through like champs, and we pretty much made a traveshamockery of the system. We won the U-T San Diego contest for a new University of California logo. I absolutely love it. I’m so proud. Four actual works of logo art, and my ridiculous 17-second lobster with a couple of floating beady little eyes, wins it all. I will paste the text below as well, but head over to the U-T to read Matthew Hall’s write up of the competition. His writing impressed the hell outta me because I had no clue how he’d handle a column where the best piece of artwork had clearly not won. He did a fantastic job. I gotta feeling this is just the beginning of this little UC lobster’s life. I dunno, maybe some t-shirts? Maybe? I’d wear one. I’d wear it with friggin’ pride. As would you, I hope, because really… this is your win, friends… not mine. Embrace it. What I would pay to have a camera in the office of UC President Mark Yudof when he opens up his mug. A symbol of Lobshots’ awesomeness… and of his failed attempt to re-brand the UC system. Ladies and gentlemen, I give you … the University of California lobster. 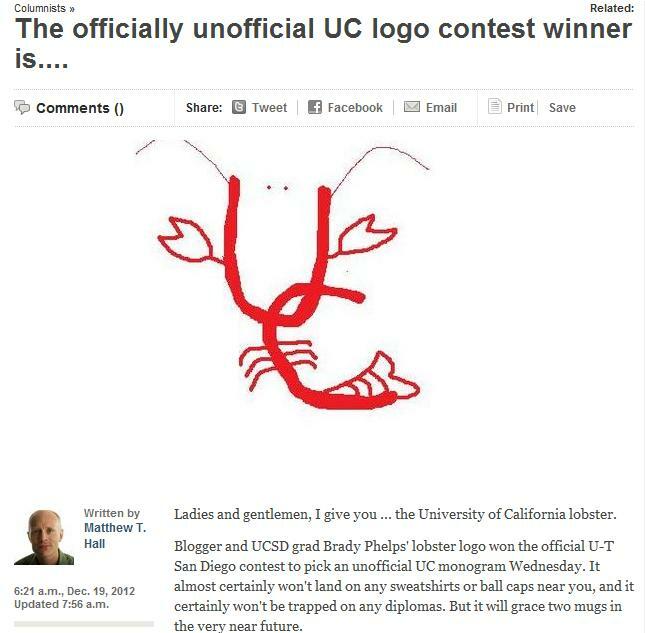 Blogger and UCSD grad Brady Phelps’ lobster logo won the official U-T San Diego contest to pick an unofficial UC monogram Wednesday. It almost certainly won’t land on any sweatshirts or ball caps near you, and it certainly won’t be trapped on any diplomas. But it will grace two mugs in the very near future. One mug will be mailed to Phelps, who won our contest with nearly 40 percent of the vote thanks to an all-out social media blitz over the past 48 hours. And another mug will be sent to UC President Mark Yudof, perhaps to drink coffee from as he pores over all the negative publicity the system received this month from its short-lived and ill-conceived rebranding campaign. That effort got flushed down the toilet on Friday, a week after a serious backlash began with a story in The Oakland Tribune and my open letter basically begging the system to lose the logo. Phelps’ lobster (an entry he said took him exactly 17 seconds, and which I short listed for his honesty and humor) beat out four other finalists in an online poll meant to show the UC system the importance of vetting a potentially controversial idea via social media. Of course, it also shows what can happen when you do just that. In the end, nearly 1,200 people voted, some more than once, many happily. When U-T reporter Karen Pearlman quipped back, “Those are hearts, not claws,” Ledford stood down and wrote, “Stands corrected.” It’s as good an indication as any of the levity this contest injected in our lives at a time when we could use it. Well done, Mr. Phelps. The only thing that will match your coffee mug when it arrives is your smiling mug. Congratulations to you and to the other four finalists and all those who interacted with us on this column subject with suggestions and comments and letters and email messages and phone calls and … well, you get the idea. This entry was posted in News and tagged LobShots, lobshots lobster logo, lobshots UC logo, lobshots ut san diego, ut san diego. Bookmark the permalink.